Her murder triggers a small-town curfew while another clown-fearing student is imperilled by “Ribcage”, a demon-possessed, wheezing clown with an elderly master. There are mild frissons of creepiness throughout CLOWNTERGEIST – including a re-enactment of the old “Humans can lick too” urban legend – but it makes the fatal mistake of over-exposing its antagonist. Ribcage’s backstory is absurd (“A paranormal shitstorm”) and there’s nothing frightening about a clown in a daylight kitchen scene being poked with a broom by our heroes and sicking up black goo. 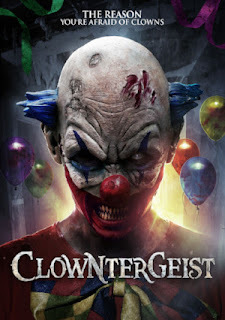 It’s an awkward hybrid of clown-slasher and supernatural horror, with feeble terrorisation via balloons and live radio.